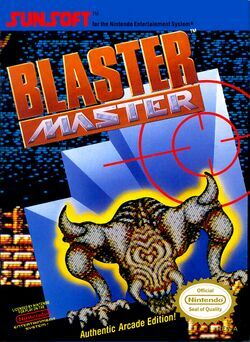 Blaster Master is a platforming and run and gun video game released by Sunsoft for the NES. It is a localized version of a Japanese Famicom game titled Chô Wakusei Senki Metafight (超惑星戦記メタファイト, Chô Wakusei Senki Metafight? lit. Super Planet Military History: Metafight), which was released on June 17, 1988. The game was released in North America in November 1988 and in Europe on April 25, 1991. The game is the first in the Blaster Master series, and it spawned two spin-off titles as well as two sequels. The game features a character named Jason who follows his pet frog Fred down a hole in the earth. There he finds a tank and uses it to battle radioactive mutants. The player controls Jason and the tank SOPHIA THE 3RD through eight levels of gameplay to find the whereabouts of Fred and to defeat the mutants and their leader, the Plutonium Boss. The game was praised for its smooth play control and level designs, detailed and clean graphics, and music, and it was criticized for its high difficulty level and lack of passwords or save points. In the original Japanese version (Chô Wakusei Senki Metafight), the game takes place on the planet Sophia the 3rd, located near the center of the Epsilon Milky Way, in which an advanced civilization flourished. In the year 2052, the emperor Goez, who has conquered the rest of outer space and declared himself as a god, and his "Inbem Dark Star Cluster" invade and conquer Sophia the 3rd. The only survivor of Goez's raid is the Science Academy's Nora Satellite, who has escaped and plans to build a weapon to defeat Goez's forces. They build an all-purpose tank called "Metal Attacker", commandeered by a boy named Kane Gardner, to take the lead in the counterattack. The game's opening sequence shows Metal Attacker dropped into the battlefield. The plot was storyboarded and adapted by Richard Robbins of Sunsoft USA for the Western release (Blaster Master) is shown at the beginning in a cinematic slideshow as ominous music plays in the background. The game starts with a person named Jason who has a pet frog named Fred who, one day, decides to leap out of his fishbowl and out the door. Fred then touches a radioactive chest, and he grows to an enormous size; Fred and the chest then fall into a hole in the earth. Jason chases Fred down the hole, which leads to a large underground cavern. While most sources say that Jason chased Fred down the hole, the game's instruction manual says that Jason fell into the hole while trying to reach for Fred. There, he finds an armored tank named SOPHIA THE 3RD – a vehicle designed to battle radioactive mutants that live inside the earth. Jason mounts SOPHIA to find the whereabouts of Fred and to destroy the mutants and their leader – the Plutonium Boss. This page has been accessed 42,394 times.